‘Sit’ and ‘stay’ are typically among the first tricks to be added to a dog’s repertoire, but our canine companions are often eager to teach us how to do just the opposite. A pup’s prescription for a happier day? Get out and get active. Embarking on even a brief jaunt with Fido may add years to your life, a new study suggests. Researchers say older adults who regularly walk at a moderate pace with their dog may be poised to live longer. 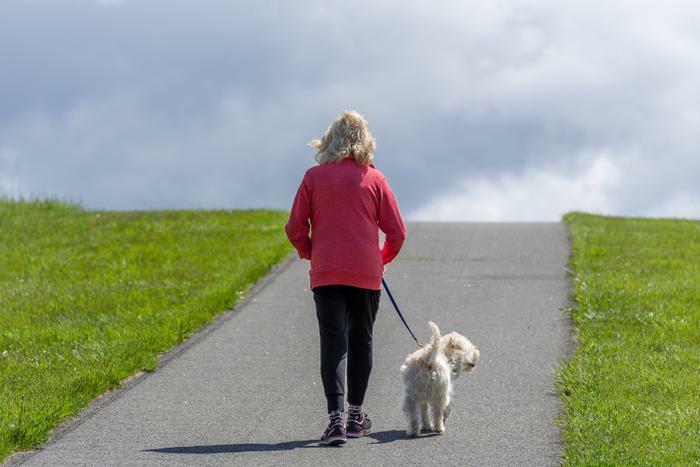 Dog-owning seniors walked an average of 22 minutes and 2,760 steps more than seniors without a dog, a recent study found. Those extra minutes may be enough to meet recommendations for physical activity set forth by the World Health Organization (WHO). To find out whether dog ownership had the potential to improve the health of older adults, researchers monitored the activity levels of 86 adults aged 65 and older. Half of the participants were dog owners, the other half were not. The findings represented “a meaningful improvement in physical activity achieved through dog walking,” said Dall. "This study indicates that dog ownership may play an important role in walking among older adults,” said the study’s co-author, Nancy Gee. “We found an objective method to monitor activity worked very well and recommend that future research in this field also include dog ownership and dog walking as important variables to consider." Dogs might help motivate seniors to be more active, the researchers concluded, which could in turn reduce the risk of heart disease, stroke, cancers, and depression.